Please [ CLICK HERE ] for available applications. In the original BMW design, the connection at both ends has a large injection-molded plastic bushing. We already know how badly plastic wears in an automotive application, and these areas are not an exception. The design of the selector rod has a pin at 90 degrees to the main rod, which exerts a tremendous amount of leveraged force on the selector joint bushing from one side (known as a single shear force). The result is a steady deformation of the bushing, resulting in looseness and slop in the entire mechanism. (figure 2) The fig. 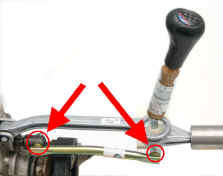 2 image shows a selector joint that has approximately 25K miles of use. Note: currently available DSSR fitments are suitable for UUC EVO 3-series shifters, original BMW shifters, and all aftermarket shifters.